This post is only for fun and meant to point out how poor security is and how easy it is to change your boarding card. Changing your boarding card may result in you not being able to board and prosecuted. Passengers who avail of our FREE online check-in service enjoy the double benefit of skipping queues at both check-in and boarding, as Check'N'Go passengers automatically receive priority boarding onto their flight. Besides that mistake and Ryanair stealing €5 from you each way if you want Priority Boarding, I thought what is stopping you editing your own printed off boarding card to give yourself Free Priority Boarding? Guide to Free Priority Boarding in 10 Easy Steps! 3. Have a PDF Printer installed on your PC. I use PDF 995, It's Free! 4. 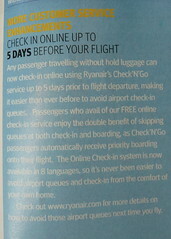 Check-in online up to 5 days before your flight and print your boarding card to PDF. 7. Add the text: PRIORITY BOARDING PASS in Arial, 14pt, Bold Italic. 8. Print the Image to PDF, scale it to A4 size. 9. Open the PDF and then print it to your physical printer. That's totally dishonest.....I love it! There are many ways in which forging a document can bring you advantages. It was probably for this reason that our forefathers made it a criminal offence, a decision that no generation has yet reversed. I agree completely, it's a false document. 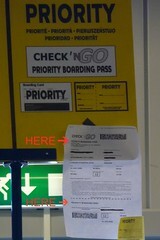 I'm just highlighting how easy it is to to modify this pre-printed boarding card. I do have a problem with them saying in their official magazine you get it for free, then charge you for it. Would I be that cheap as to modify my boarding pass just to get comfortable sooner? "There are many ways in which forging a document can bring you advantages. It was probably for this reason that our forefathers made it a criminal offence, a decision that no generation has yet reversed." WHen I recently detected a forged driving licence at DUBLIN PORT , reported it to the port police , and refused the passenger travel , I was told that I acted Wrongly ! And was fired the next day ! All hail the law of our forefathers ! I love that companies are more and more relying on self-printed documents for verification, without adding any sort of checks and balances to their systems. I knew that once I didn't change the barcode on the pass I was ok. I had an original copy with me incase there was any problems, which there wasn't as you know how rushed they are to get everyone onboard. Altho on that flight something strange happened. As I was going up to board, the new flight attendant who was taking the boarding cards was being given out to be his superior who was scanning in the collected boarding cards. She was saying to him that he had to check that the name on the ticket matched the passport, as she was getting an error that this passenger has already boarded. On board before take off there was a call out for a Mr Smith (or whatever the name was) to make themselves known. Several times they tried to identify them, but no one confessed to being the named person. Did someone print two copies of their pass to get someone a free flight? You calling me or Ryanair a crook? And how am I selling myself? Vous appellez-moi ou Ryanair Les escrocs? Comment suis-je vendre moi-même? I wouldn't try this in the near future. The Bar code is being upgraded to include the fact that Priority Boarding has been paid for. Once they scan in the Bar Code it will give different indications indicating whether the Passenger purchased Priority Boarding. Even if they miss you as you walk through the gate it show the error when they do the final flight numbers so they will come and off load you !! Boarding passes do not look the same as depicted. Will you update your process? The New Ryanair Boarding Cards have changed. I'm afraid I don't have any update on what they look like. You are going to have to pay for priority boarding yourself or guess! it depends on the airport, i think. often in small airports they scan the pass only once, when you enter the gate. not in the actual queue to enter the plane, where they're usually just trying to herd people onwards. here they only check the boarding passes with a quick glance. if this is the case in your airport, the best procedure is probably to print two versions of the pass with only one of them altered. present the original for scanning at the gate-entry and the modified one later in the actual queue. remember to partly tear your false document just like the desk official did with the real one. this eliminates the possibility of them getting you by crosschecking the printed information with the barcode. only way they could catch you is by actually counting the number of people entering through the priority queue. I've never seen them do that. i have not done this yet though, too scared. How did you get caught, dear anonymous? maybe they scan the passes later after you already went through, since the part they rip off and keep also has a barcode on it.